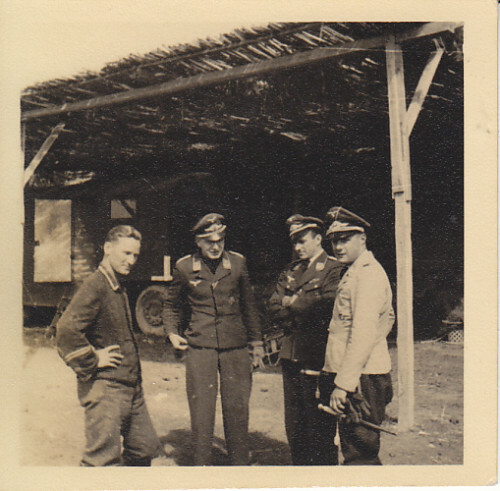 Pilots of 3./JG 53 at readiness (Bereitschaft) at Gela/Sicily early in 1942. Seen from the left are Lt. Hans Roehrig (RK on 2 October 1942, 75 Luftsiege in total, KIA on 13 July 1943 in combat with Spitfires over Syracuse/Catania), Spieß Hauptfeldwebel Eckhard, Uffz. Franz Hagedorn, a 37-victory ace, killed in action on 10 September 1942, Fw Fritz Gammel, a nineteen victory ace, KIA on 23 August 1942 and Ofw. Heinrich Leschert who achieved 21 or 23 victories. Leschert's first victory was a 'Wellington' over France on 14 May 1940. Leschert's last victim was shot down on 10 August 1942 but the Mig 3 he hit disintegrated, the debris bringing down Leschert's Bf 109 G which crashed before he had time to bail out. He was 28 years old. 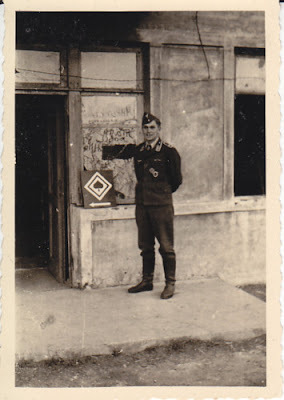 Last in the line is Wilhelm Crinius, a future Eichenlaub (Oakleaves) winner who would achieve 114 Luftsiege (victories). 3./JG 53 Gela/Sizilien im Frühjahr 1942. Seen above from the left are Werkmeister Ofw. Krüger, Staffelkapitän Oblt. 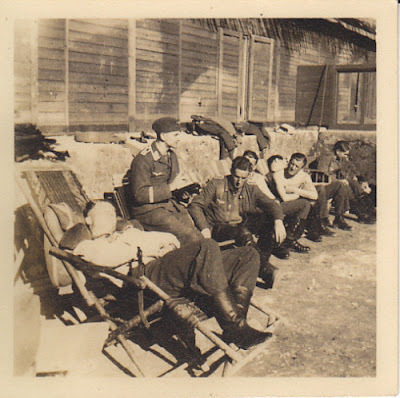 Wolfgang Tonne, awarded the Ritterkreuz on 6 September 1942 and the Oakleaves less than three weeks later on 24.9.1942. In total credited with 122 victories, although following his 122nd on 20 April 1943 Tonne was killed in a crash while attempting to land at Tunis-Protville off a steep turn with landing gear extended. Alongside him is Oblt. Karl Leonhard, an ace with 23 victories who survived the war and Lt. Walter Seiz, who tallied 14 victories before becoming a POW on 24 August 1944. Below; Oblt. Karl Leonhard. 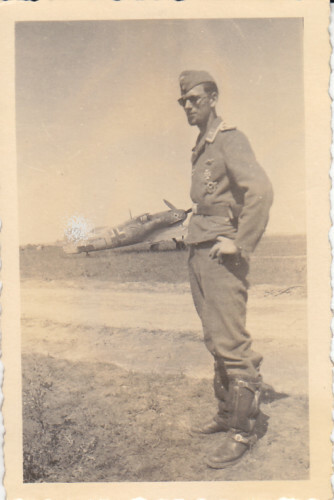 Fw Wilhelm Crinius of 3./JG 53 seen below in late September 1942 in Stalino wearing an EK 2 (Iron Cross 2nd Class) to represent his recently awarded RK. He received both the RK and the EL on the same day, 23 September 1942, the only Jagdwaffe pilot to receive the two awards simultaneously. He was pictured here shortly before departing for Germany to receive both awards from AH. 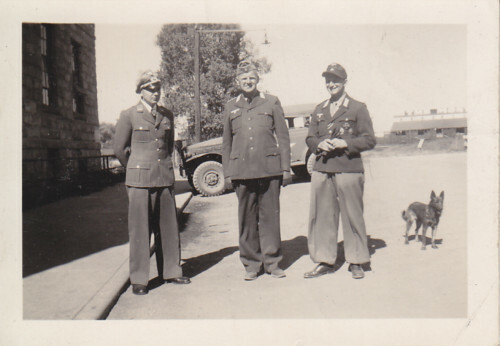 Below left; Lt. Wilhelm Crinius. 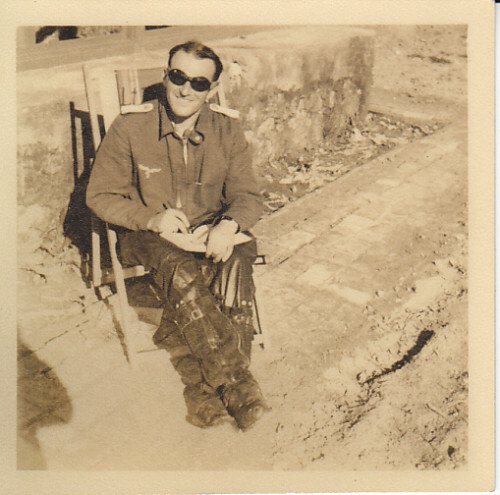 Photographed in early 1943 as a POW (in Kriegsgefangenschaft) in Monte Vista. Of his 114 victories, 100 of these were achieved between 9 June 1942 and 23 September 1942 ! Following combat with Spitfires on 13 January 1943 he was forced to make an emergency landing near La Calle and was taken captive the following day. Second from left is Stabsarzt Röpel. Bf 109 F seen in Molodetschno or Sobolewo in June/July 1941flown by the Gruppenadjutant of the Stab III./JG 53 with 4 Abschußbalken (victory markings) on the rudder. In the foreground is Uffz. Herrmann Spengler Flugzeugführer (pilot) in 5./JG 52, posted missing on 11 August 1941, credited with a single victory. Fascinating. I often wondered what evidence there was to back up the fantastic claims made by I/Jg 53 in summer of 1942-918 claims in 14 weeks!! !